The sidebar at the right contains two downloadable files. The first is all of the factory program banks for the Prophet Rev2. The second is the set of 16 alternative tunings included with the Prophet Rev2. Each of these downloads includes installation instructions. These are also given below. The program data is in a MIDI System Exclusive (SysEx) file. You will need a DAW, MIDI utility, or other application capable of opening and sending MIDI System Exclusive (SysEx) messages. MIDI-OX (Windows) and SysEx Librarian (Mac OS) are shareware MIDI utilities that can reliably be used to update DSI instruments. You will also need either a USB cable (Type A to Type B connectors, like a typical USB printer cable) or a MIDI interface and cable to transmit the SysEx file from your computer to the Prophet Rev2. Be aware that loading the factory programs overwrites any user programs that are currently in memory. If you have programs you want to keep, be sure to save them to a SysEx file first. Refer to the manual for more information about initiating a SysEx dump from the Prophet Rev2’s front panel controls. Connect your synthesizer to a computer using a USB cable (or MIDI cable, if you are using a dedicated MIDI interface). Press the Global button on your Rev2. Use the Parameter knob to select “MIDI sysex cable” then use the Value knob to choose either USB or MIDI, depending on which port you are using to connect to your computer. 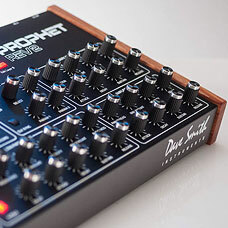 If using a MIDI interface, connect the computer’s MIDI out to the Prophet Rev2’s MIDI in. Depending on the type of interface, you may also need a MIDI cable. In the lower left quadrant of the window, select the MIDI port to which the instrument is connected. If connected via USB, choose “Prophet Rev2” (or “USB Audio Device” under Windows XP). If connected via MIDI, choose the MIDI interface. The selected MIDI port appears in the Port Mappings window. Set the Low Level Output Buffers “Num” and “Size” to 4096. From the Command Window menu, choose “Load File.” Browse to and open the Prophet Rev2 programs file. From the Command Window menu, choose “Send SysEx.” They will replace any existing programs in those memory locations on the synth. Click Play. They will replace any existing programs in those memory locations on the synth.